Creation: Appeared in July 1933 as a renumbering of VA 526 running as it does today. This is the 2nd VA 181. Comment: VA 181 connects US 13 to Belle Haven. The E-W portion of VA 181 was once part of US 13. VA 181 #1: Appeared in March 1924 as new routing, running from VA 18 (now VA 6) southwest 2 miles to Nellysford. In August 1928, VA 181 was renumbered as VA 315. Today it is VA 151 which has since been rebuilt. Parts of SR 612 and SR 613 use the original VA 181 alignment. Creation: Appeared in July 1933 as a renumbering of VA 530. Ran as it does today. This is the 2nd VA 182. Adjustments: It is possible VA 182 used SR 1203 in Painter instead of the its current route but stopped doing so by 1936 if it ever did. Posted: Fully posted; a cutout at SR 600 SB Mappsburg was still there in 2008 but was gone by 2012. Comment: VA 182 is just another unassuming route on the Eastern Shore. VA 182 #1: Appeared in March 1927 (CTB) as new primary routing, running from VA 18 (now VA 151) near Piney River west 1.75 miles towards Lowesville. In August 1928, VA 182 was renumbered as VA 313. Today it is SR 778. VA 182 #1 does not appear on any maps I have found. Creation: Appeared in July 1933 as a renumbering of VA 537. This is the only VA 183. Ran from Willis Wharf (just east of today's SR 694) west through Exmore toward Silver Beach for a distance of about 5 miles. See scan in VA 182 entry. Adjustments: In Aug 1933 (CTB), VA 183 was extended west 1.5 miles. In Sept 1934 (CTB), VA 183 was extended west 2.14 more miles towards Silver Beach. In May 1963 (CTB), VA 183 east was truncated to US 13 Bus Exmore, leaving behind SR 603. Improvements: Paved at time of inception except a short stretch just west of Exmore, which was paved in 1935. Other names: Occohannock Neck Rd. Comment: VA 183 continues as SR 613 to Silver Beach. Creation: Appeared in May 1957 (CTB) as a renumbering of US 13 ALT, running the way it does now. This is the 2nd VA 184. Posting: Fully posted east of Cape Charles; poorly posted in Cape Charles last time I was there in 2008. Comment: This was the original route of US 13 approaching the ferry across Chesapeake Bay. VA 184 #1: Appeared in July 1933 as a renumbering of VA 527. Ran from US 13 Nassawaddox to Franktown in an 'L' shape. In March 1953 (CTB), VA 184 downgraded to SRs 606 and 618. Creation: Appeared in March 1964 (CTB) as an upgrade to SR 675, running as it does now. This is the 2nd VA 185. Posted: Fully posted; last known cutout removed from US 11 NB in mid-2000s. Fully posted as a duplex with SR 675. Other names: Stoney Creek Blvd. Comment: Another short primary connector from I-81 to US 11. Both the 2003 route log and the 2007 traffic logs explicitly put VA 185's west end beyond I-81. VA 185 #1: Appeared July 1933 as a renumbering of VA 524 running from US 13 (now Bus 13) Eastville east to the railroad tracks at Eastville Station. In March 1952 (CTB), VA 185 was downgraded to SR 631. To: North Carolina State Line near Branchville (Southampton County). The route continues 16 miles as NC 186 to end at US 301 Garysburg, NC. VA 186 #1: Appeared in July 1933 as a renumbering of VA 525. It began at US 13 (now 13 Bus) Cheriton and headed south to Kiptopeke. Its southern endpoint was where current SR 600 met the now-removed railroad, which is literally just to the east of the US 13/SR 600 jct. Sometime in 1950 (per April 1951 CTB), US 13 was rerouted from Cape Charles to the Kiptopeke Ferry location. Some of this rerouting was directly on VA 186. So VA 186 was truncated to the US 13/SR 683 location near Capeville, leaving behind SR 641, SR 684 and US 13. The next year, it looks like the rest of VA 186 was downgraded to SR 600 and SR 683. Creation: VA 187 was created in July 1933 as a renumbering of VA 531, running the way it does today. This is the only VA 187. Posted: Fully posted at US 13 and VA 316; Only posted with a white rectangle at SR 658 and not at all at its eastern endpoint, though it is posted well along its SR 679 duplex. Comment: VA 187 is easily the least improved primary route on the Eastern Shore, with secondary characteristics in most locations. The 1939 VDOT report on primary system development had recommended that VA 187 be decommissioned east of US 13. Creation: Number assigned between 1944-49 running essentially as it does today. I cannot find a CTB reference for this but it appears in the 1949 VDOT Route Log. Note that this corridor was assigned as a primary route with no number in July 1932 CTB. This is the 2nd VA 188. Adjustments: Sometime after 1975, VA 188 was placed on one-way alignments at its southern end. This was likely to accomodate US 60-220 being placed on one-way alignments of their own. The original VA 188 alignment used the current NB routing. Posted: Extremely well-posted on 188 itself; not posted at all from US 60 Bus WB or at its northern endpoint. Comment: VA 188's NB segments are west of the SB segments. VA 188 connects US 60-220 to SR 606 which is a prominent way to reach the Homestead, or so signs along VA 188 would have one believe. VA 188 didn't appear on VDOT Officials until 1994. VA 188 #1: Appeared in July 1933 as a renumbering of VA 534, running from US 60 Norge east to SR 606/607 Croaker. In April 1944 (CTB), VA 188 was downgraded to SR 607. Today, it is also Norge Ln and Maxton Ln at the railroad crossing. 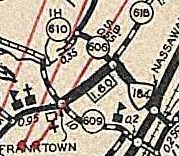 Oddly, VA 188 is shown as VA 100 on the 1936 James City County map. Creation: Appeared July 1933 as a renumbering of VA 535. Originally ran from US 158 (now US 258 Bus) Franklin south and then east to loop around to end at US 58 Holland. This is the only VA 189. In March 1934 (CTB), the route was removed from today's SR 686 in Nanesmond County (at the eastern end of VA 272), as well part of today's SR 666/615 east of the Blackwater River. In Sept 1940 (CTB), VA 189 was extended north 0.04 miles to US 258. It appears when primary maintenance was dropped from all incorporated towns in 1929, they never reassigned the small portion of this route into the primary system until now. In May 1943 (CTB), VA 189 was rerouted at the Blackwater River to instead go to US 258 like it does today, replacing VA 315. The old route to Franklin became SR 714. In Nov 1975 (CTB), VA 189 was placed on a new bypass of Holland, leaving behind VA 189 Business. In 1983 or 1984, VA 189 was removed from the Holland bypass and re-sent back into Holland as it does today, replacing VA 189 Business. The Holland Bypass remained part of US 58. Around 1989, VA 189 was rerouted onto new construction to meet the US 58-VA 260 interchange east of Franklin. The old route became VA 272. The rest was paved in 1936. VA 189 was multilaned on what is now its US 58 duplex since Nov 1975. Posted: Fully posted; However, VA 189 is extremely poorly posted on its US 58 duplex. No mention at VA 272 or where the route splits to head to Holland. GMSV shows a shield at both old SR 612 and old SR 616. Comment: VA 189 between SR 714 and VA 272 was still original concrete in late 2012, per field visit by Froggie. The VA 189 routing really makes no sense to me. VA 189 south of US 58 should be part of US 258. 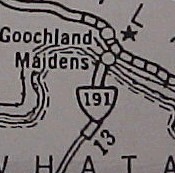 VA 189 could then just be reduced to the short stretch in Holland. VA 189 removed from Franklin. VA 189 Business: Appeared in November 1975 (CTB) as a renumbering of VA 189 into Holland. It was also specifically defined to continue east on US 58 back to the new VA 189 Bypass (now US 58 Bypass). This stretch had never been part of VA 189. In 1983 or 1984, VA 189 Business reverted back to mainline VA 189. However, it appears in the 1985 VDOT Traffic Log (but not 1990). When I lived in Tidewater in 1991, this was still partially posted as Business 189. A field visit in Oct 2009 showed it still posted as 189 Business leaving 58 Business. Creation: Appeared in March 1956 (CTB) as a renumbering of part of VA 166. It initially ran from VA 166 to VA 165 Kempsville. This is the 2nd VA 190. Adjustments: In July 1962 (CTB), Princess Anne County requested VA 190 be extended north to VA 166 (now Shell Rd) Robbins Corner. This request was denied. The June 1964 CTB had VA 190 east truncated to the Chesapeake-Virginia Beach line as part of the creation of VA 225. However, it didn't appear to have actually been truncated. In Aug 1980 (CTB), VA 190 was extended north to VA 225 as upgraded routing over what had once been SR 647. Current VA 190 original routing. VA 190 extended to VA 225. Improvements: VA 190 was paved upon inception. 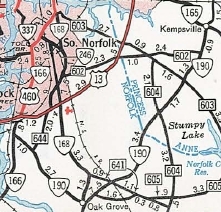 VA 190 was multilaned from roughly Indian River Rd to VA 165 in 1972. When extended north it was multilaned to US 58. In 1983 or 1984, VA 190 was multilaned most of the way north of US 58 to VA 225. In 1988, VA 190 was multilaned from Indian River Rd south to Centerville Tpk. In 1990, the gap near VA 225 was multilaned. Posted: Fully posted, although not well north of US 58; SR 190 shields in Virginia Beach were nearly universal. At least one, at VA 225 SB was still up in 2007 but was gone by February 2013. Unposted from US 58 for many years, but finally posted at US 58 by February 2013. Not posted from I-264. Comment: VA 190 is not one of those routes you'd probably drive from end-to-end on to get anywhere. The interchange with I-64 is a single off-ramp from the Norfolk-bound direction of I-64. The 1939 VDOT report on primary system development had recommended that VA 190 (then VA 166) be decommissioned from Great Bridge to VA 165 Kempsville. 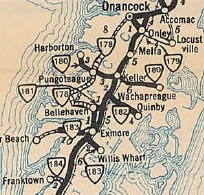 In Aug 1933 (CTB), VA 190 was extended across the Blackwater River via ferry to connect to SR 615. This was an upgrade to SR 608. In May 1952 (CTB), VA 190 was downgraded to SR 726. Today it is Blackwater Rd and Pungo Ferry Rd. As late as 1993, there were SR 615/726 signs at their intersection in the City of Virginia Beach. Creation: Appeared in July 1933 as a renumbering of VA 539, running about the way it does now. This is the 2nd VA 191. Adjustments: About 1983, VA 191 was extended south underneath what is now the I-664 bridge. This had been a piece of US 58-460 ALT which was moved to its current location. About 1992, VA 191 was rerouted on its north end to accomodate the I-664/VA 337 interchange leaving behind Old Joliff Rd. Posted: Fully posted except not south of US 58-460 ALT. This section is posted as US 13 NB and US 460 WB. Comment: VA 191 is essentially a glorified frontage road to I-664 and serves no real primary purpose. Although there are VA 191 shields on BGSs on I-664 at its interchange with US 13-58-460, there are no direct ramps to VA 191 which crosses I-664 a little north of that interchange. The 1939 VDOT report on primary system development had recommended that VA 191 be decommissioned in its entirety. VA 191 #1: Appeared March 1927 (CTB) as new primary routing, running from VA 19 (now VA 6) near Goochland CH south to Jefferson. In August 1928, VA 191 was renumbered as VA 417. Today it is US 522 and also SR 669 south of the James River. In Maidens VA 191 used parts of SR 716 and 717. Creation: Appeared in May 1952 (CTB) as an upgrade to SR 600, running as it does now. This is the 3rd VA 192. VA 192 was multilaned from VA 165 to Norview Ave in 1980. Posted: Not posted. Shields previously existed at VA 165, but they were gone by early 2013. Shields had also existed at VA 170 in the early 1990s. Comment: Skirts the Norfolk International Airport and serves the Norfolk Botanical Gardens. VA 192 #1: Appeared in July 1933 as a renumbering of VA 541. It ran from VA 10 Chuckatuck northeast toward Crittenden. In Aug 1933 (CTB), VA 192 was extended east 0.83 miles (2.2 miles short of US 17). In June 1947 (CTB), VA 192 was downgraded to SR 628 (now Crittenden Rd in Suffolk) except the westernmost bit is part of VA 125. It currently comprises about half of the posted detour for VA 125 around the Nanesmond River. VA 192 #2: Appeared April 1951 (CTB) as an upgrade to SR 601, running 0.71 miles from VA 165 to Norfolk Municipal Airport. In May 1952 (CTB), VA 192 was downgraded back to SR 601. Today it is Robin Hood Rd. Part of the original concrete roadway still exists on this route. Creation: Created May 1948 (CTB Minutes) as an upgrade to SR 604, running from VA 7 to VA 123 (now SR 3563 Old Chain Bridge Rd). This is the 2nd VA 193. Adjustments: In Nov 1963 (CTB), VA 193 was extended east to its current end, replacing a bit of VA 123. Improvements: Paved upon inception; Multilane only right at its eastern end. Comments: VA 193 is not recommended for trucks west of I-495 as there are several 20 mph curves. However, there is no posted VA 193 TRUCK...use VA 7 if you would. VA 193 follows the much older Georgetown Turnpike toll road. VA 193 #1: Appeared July 1933 as a renumbering of VA 543, running from US 17 Wallaceton east to VA 27 (now old VA 168) near the NC/VA line. In May 1945 (CTB), VA 193 was downgraded to SR 740 and today is just Ballahack Rd. Creation: Appeared in June 1947 (CTB) as an upgrade to SR 673, running on Sewells Point Rd from VA 13Y (now VA 166) to VA 165-168 Little Creek Rd. This is the 2nd VA 194. Adjustments: In March 1953 (CTB), VA 194 was rerouted at Norview Ave to use Chesapeake Blvd (replaced SR 678). In Dec 1980 (CTB), VA 194 was extended north to US 60. However, as late as 1993 there was still an END 194 shield at VA 165 and no 194 postings north of there. VA 194 became posted to US 60 around 1999. The extension north of VA 165 was already multilaned at that time. Posting: Fully posted; error I-194 shield at VA 247 exists in 2009. Comment: A totally urbanized primary route. VA 194 extended to US 60. VA 194 #1: Appeared in July 1933 as a renumbering of VA 544, running from VA 35 to the railroad crossing in Newsoms. In May 1946 (CTB), VA 194 was downgraded to SR 673. Creation: Appeared as new designation for the Downtown Expressway in Jan 1976 (CTB) as a renumbering of what was VA 88 in the planning stages of the road. Initially was only open west of US 60 to its present transition to I-195 which is at the McCloy Street overpass. This is the 2nd VA 195. Adjustments: In 1977, VA 195 was extended east to connect with I-95 North. In 1978, ramps to and from I-95 South were opened. Improvements: Fully multilane expressway upon opening. Comment: VA 195 has been a toll road for its entire existence which connects I-195 and the Powhite Pkwy to I-95 through downtown Richmond. VA 195 #1: Appeared in July 1933 as a renumbering of VA 545, running from VA 32 (now SR 730) Branchville due south to the North Carolina Line. In Sept 1934 (CTB), VA 195 was rerouted to run from Branchville southwest along the railroad tracks to reach North Carolina as new construction. This left behind SR 701. IN Sept 1940 (CTB), VA 195 was extended east to VA 35 Boykins, replacing a little bit of VA 32. In Aug 1973 (CTB), VA 195 was renumbered as VA 186. Creation: Appeared in Sept 1942 as an upgrade to SR 649, running as it does today. This is the 2nd VA 196. Improvements: Paved upon designation; entire route is 4-lane undivided but I don't remember if it was this way in 1991 and Official maps still show it as 2-lane. Comment: VA 196 is strictly a residential route these days. VA 196 #1: Appeared in July 1933 as a renumbering of VA 546. Ran from VA 31 Wakefield east to just short of Walls Bridge over the Blackwater River. 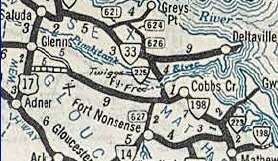 In Sept 1942 (CTB), VA 196 was downgraded to SR 617. Creation: Appeared in the January 1962 CTB defining the route it uses today. However, per the July 1966 CTB, VA 197 was not actually in place until July 1966. Ran as it does today. This is the 2nd VA 197. Improvements: Paved upon designation; 100% multilaned. Posting: fully posted; a couple cutouts remain; white border shields WB where it transitions from Laburnum to Malvern; erroneous VA 197 east shield leaving past US 1-301. Comment: VA 197 has a very brief one-way split leaving Laburnum. VA 197 #1: Appeared in July 1933 as a renumbering of what I believe was part of a VA 19 and VA 418 duplex. Ran from VA 6 to VA 147 along Three Chopt Road. 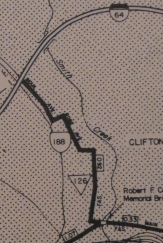 In July 1966, VA 197 was downgraded to plain old Three Chopt Rd. Creation: Appeared in July 1933 as a renumbering of all of VA 601 (west of Cobbs Creek), a piece of VA 38 (Cobbs Creek to Mathews) and a small piece of VA 600 (Mathews to Moon). Initially ran from Moon west through Mathews and Cobbs Creek into Gloucester County. This is the only VA 198. Adjustments: In Oct 1935 (CTB), VA 198 was extended west 6.51 miles to Cash. In Sept 1937 (CTB), VA 198 was extended west 1 mile. 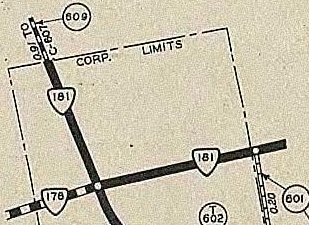 In May 1938 (CTB), VA 198 was extended to US 17 at Dutton. In Oct 1969 (CTB), VA 198 and SR 601 swapped routings, giving VA 198 its run to Glenns. Improvements: paved from Cobbs Creek to Moon upon inception. The rest of VA 198 was paved in 1947. VA 198 has no multilane segments. Comment: VA 198's old alignment on SR 601 contains what may be the last white border SR shield in Eastern Virginia. The 1939 VDOT report on primary system development had recommended that VA 198 be decommissioned east of Mathews. Creation: Appeared about 1975 as a Super 2. It initially ran from VA 5 to VA 143 Busch Gardens. This is the 2nd VA 199. Adjustments: Around 1976, VA 199 east was extended to SR 641, including an interchange with I-64/VA 168. Around 1993, a second piece of VA 199 opened between US 60 and I-64 in the Lightfoot area as new freeway. The two segments were connected west of Williamsburg about 1999. VA 199 was initially multilaned only at the VA 5-31 area. In 1976, VA 199 was multilaned at VA 132 and from US 60 to near SR 641. About 1989, VA 199 was fully multilaned except one small gap at Quarter Path Rd and another between VA 31 and VA 132. All segments of the western half of VA 199 were multilaned when they were opened. About 2004, VA 199 was multilaned at Quarter Path Rd. Per Kenny Bumbaco, VA 199 was multilaned from VA 31 to VA 132 between 2004-07, making VA 199 100% multilaned. Comment: VA 199 is a limited-access road with both interchanges and at-grade intersections. Combined with I-64, it effectively forms a limited-access loop around Williamsburg. The segment from just north of VA 5 WEST to just south of I-64 is technically a full freeway. First, this segment is SR 641 and has not been appreciably upgraded (unlike the rest of VA 199). 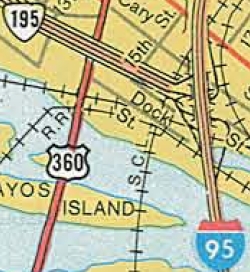 Second, at the time VA 199 in that area was built and lasting as late as the early '90s, there were proposals for an additional York River crossing in the area, extending from where VA 199 ends. Proposals for a new crossing were eventually dropped in favor of the US 17 Coleman Bridge widening in the mid-90s. VA 199 #1: Appeared in July 1933 as a renumbering of VA 604. Ran from US 360 Millers Tavern to Bowlers Wharf (2 miles east of US 17). 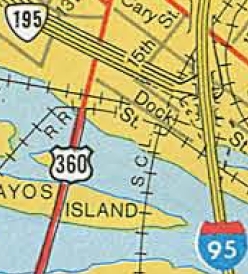 About 1957, VA 199 was downgraded to SR 684. VA 199's old east end is literally in the river as a recent field visit discovered. Creation: Appeared in Appeared July 1933 as a renumbering of VA 605. It initially ran from White Stone directly to Kilmarnock then to US 360 Burgess. This is the 2nd VA 200. Adjustments: About 1934, VA 200 was straightened out between Kilmarnock and Burgess to its current route. It had been using Tipers Ferry over the Great Wicomico River; private road through subdivision; SR 678; SR 609; all the SR 679 loops. In Jan 1941 (CTB), VA 200 was removed from SR 699 above the Wicomico River. In Aug 1941 (CTB), VA 200 was extended south over SRs 638/637 from White Stone to a ferry over the Rappahannock River, then replaced SRs 621/640 to VA 33. In Oct 1956 (CTB), VA 200 from VA 33 to White Stone was renumbered as part of VA 3. In Feb 1985 (CTB), VA 200 and VA 3 swapped alignments from White Stone to Kilmarnock. The remainder was paved in late 1934. Legislative names: Jessie Ball duPont Memorial Highway (entire route), since 12/15/88. Comment: VA 200 is a very direct way to get to Northumberland County from the south. VA 200 #1: Appeared in August 1928 as new primary routing. Ran from VA 23 (now VA 8) south of Stuart 18.06 miles to past Ararat, about 3.6 miles short of the North Carolina line.